Back in 2007, Ford acquired a Brazilian company called Troller Veiculos Especias (or just Troller, for short). In 2012, the American automaker still hadn’t produced anything under the Troller brand, but it did introduce the T-R Concept at SEMA. It was a badass SUV that looked like a cross between a Jeep Wrangler, an old Bronco, and a Toyota FJ Cruiser—a combination that somehow exceeded the sum of its parts. 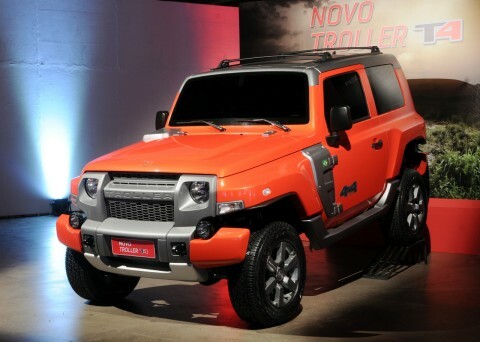 Last week, Ford finally announced the Ford Troller T4, the first new vehicle to come from the Brazilian brand since Ford’s acquisition and a slightly more modern take on the aforementioned concept. It’s got a 3.2-liter diesel engine paired with a six-speed manual that produces an as-of-yet unknown amount of power, but we imagine it won’t be lacking in ponies or torque if the T4’s brutish looks are anything to go by. The downside? The Troller T4’s muscular lines and impressive visuals are highly unlikely to ever grace American roads. Well, bummer.